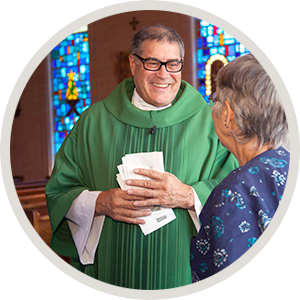 Cross Catholic Outreach, a 501(c)(3) non-profit organization, is seeking Roman Catholic priests in good standing, who might have some weekends during the year (which would not impact their duties within their Diocese or their ministries), to join our “Outreach Priest” Speakers Bureau. Through this effort, priests speak in U.S. churches nationwide, sharing the Gospel and educating the U.S. faithful about the needs of the poor throughout the developing world. Outreach Priests join our ministry with the understanding that their role as ministry ambassadors extends beyond parish speaking. Perhaps you have some doubts if you would be called to this kind of ministry? We offer homiletics training, so you will be well-prepared for such ministry. Below is a personal story from one of our Outreach Priests, in which he describes how working for our ministry has impacted his life and of the many blessings he has received through preaching on behalf of the suffering Christ in our world. To join our team please contact Joanne Miceli-Bogash by email at JMiceli-Bogash@CrossCatholic.org or by phone at (800) 914-2420 Ext. 174.